Wir verwenden Cookies, um Ihnen bestmögliche Services zu bieten. Wenn Sie auf der Seite bleiben, stimmen Sie der Cookie-Nutzung zu. Serving all contact channels is just as much a part of true customer service as quick access to tools from various providers and information from various portals. We connect the right interfaces for you. link|that Contact Center creates unique customer experiences - in every interaction, across all channels. Thanks to modern interfaces our communication solution is future-proof and fits seamlessly into existing environments. Flexibility is our priority: Let's find the best integration possibilities for all existing and new systems together. We connect the communication channels telephony, mail, chat, apps (WhatsApp), web, fax and mobile, so your agents are able to work efficiently. Support of around 20 languages is ideal for international teams and projects. 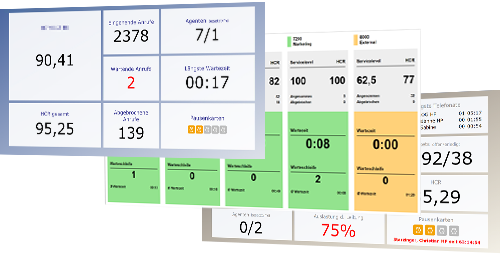 Our customers also appreciate our flexible Live Monitoring and Wallboards, where information from a wide range of data sources unites in one clear view. For example, your agents see at a glance how many external tickets have been processed, what status hardware components have, when the next break is available, etc. You can also combine all data sources in the extensive reporting tools. link|that CC helps you understand customer communication, analyze productivity and visualize data. The LinkThat softphone combines all CC features. It is the central control unit for all telephony features, while also combining all interfaces to third-party services. Profit from customer recognition and presence and queue information wherever you are. 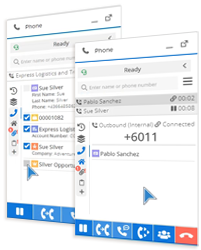 All telephony controls are provided, as well as the ability to do screen and case transfers. The latter sends open tabs as call attachments to colleagues. You can reach us via phone +43 1 33 44 0 44 and email office via linkthat to eu. link|that has been SAP Services Partner in Austria since 2011 and took part in the SAP EcoHub in 2012. Numerous installations of SAP Business Communications Management and the integration of other SAP products in the link|that Cube solution were achieved by the close cooperation between our companies. 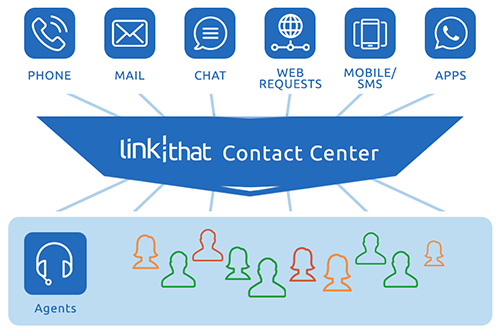 LinkThat Contact Center presents new opportunities when combined with our other products: Use telephony data for easier creation of workforce schedules, or take advantage of customer recognition on the go and automatic ticket creation. Cloud-based employee scheduling enables the right service personnel to deliver the best assistance possible at the right moment - while costs are kept to a minimum. Our Incident Management and Ticketing System provides an overview of all your tasks and activity streams at all time.